Will Foldable Phones Take Off in 2019? The year 2019 is all set to witness the next stage of mobile phone evolution and the most awaited news of the year has to be the foldable displays of Smartphones. The news of foldable Smartphone displays has been going around for years, in the form of manufacturing reports, patents, rumours, and prototypes. The revolutionary change has been led by the South Korean tech giant, Samsung Electronics and it is all set to be the game changer in the global market for Smartphones. 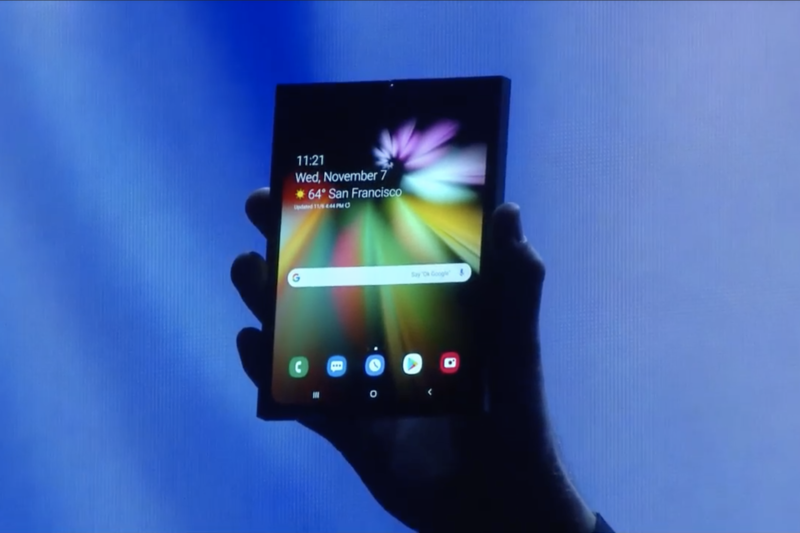 The chatter has been going around regarding the foldable phones for quite some time, and it feels like the floodgates have finally opened in 2019. The brand ZTE has already launched a product in the foldable category, known as the Axon M. It is remarkably different than the earlier versions of foldable phones where there were two separate displays with a fold in the middle. This new tech is all about cool single and flexible screens. Talks and testing are on to bring out the device in multiple forms, but the first versions mostly concentrate on outward folding displays that wrap around the back and front, instead of wrapping inside like the pages of a book. The chief of Samsung has talked openly about the progress of the company regarding the foldable displays. According to the announcements made by the company so far, the ‘Galaxy F’ model will have an organic LED screen, called Infinity Flex Display, which will measure around 7.3 inches diagonally on opening. There is no doubt about the fact that the foldable Smartphone is all set to be the next big leap in the world of Smartphone technology and the tech gurus have several ideas as to how this latest advancement can change the game in 2019. Here’s how the technology like that can change the industry. The Smartphones now come with better displays, more RAM, faster processors, and clearer cameras. But come to think of it, nothing has changed about the way a phone works and all the improvements only focus on how well the phone can do its essential functions. Foldable screens can radically change one display into two displays just as the dual-monitor setups already available with the computers. The dual-monitor setup of the computers has brought in such an improvement in the quality of life that people cannot think of other options. The flexible phones are all set to bring in the similar benefits of multitasking. Think of how the games and apps can be made in keeping with two displays, thereby, ensuring additional functionality. The toggles and overlaid buttons no longer need to crowd the display, and you can quickly shift them on the other screen. Besides, it will also be cool if these phones can allow more input methods, like flexes and bends, rather than just swipes, pinches, and long press. The cameras are the essential feature for the Smartphones for most people, and the manufacturers strive hard to provide superior features on both front and rear cameras. There is no denying the fact that the Smartphone camera has come a long way ever since its introduction but a fundamental problem persists. The manufacturers have to sacrifice the quality of either the front or the rear camera for optimizing their resources and spending. With the outwardly flexible phones, one camera can be used as both the rear and front camera, depending on whether the phone is closed or open. When the manufacturers get the freedom to focus on providing you with only one excellent camera, they are also able to free up space in the handset to incorporate other vital components. Folding screens might not wholly rule out cracked screen, but they can at least limit such occurrence considerably with their flexibility. Regardless of how durable the gorilla glass of the present Smartphones is, these are still prone to scratches and cracks. Though the material to be used for the flexible phones is yet to be known, one thing is for sure: these phones will be enough impact resistant to not crack in an accidental fall to the floor. Time to bid goodbye to expensive repairs, cracked screens, and bulky phone cases! It is still sometime before the foldable phones hit the market and become commonplace. But one thing is for sure, the era of foldable Smartphones is coming, and it starts this year. Thedroidguru is an Android Blog which provides how-to guides, rooting guides, latest news, firmware updates.